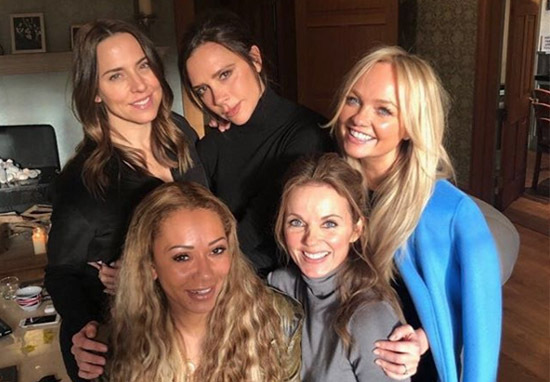 The Spice Girls are officially back together and getting ready for a new tour, with all five of the girls getting back together. You know what they say, friendship never ends, especially not between Baby, Sporty, Scary, Ginger and Posh all under the same roof. Rumours of a reunion circulated earlier today after pictures circulated of Mel B, Mel C, Emma arriving at Geri Halliwell’s house, though Posh was nowhere to be seen. Thankfully Victoria posted a picture online with the five together, saying she was ‘excited’. Reports suggest the group have reunited to discuss an upcoming tour which could see the lot of them earn £10 million each. Sadly though, Posh is believed to have sought assurances that she won’t be singing, in case it harms her fashion business. They are reportedly considering TV projects in China as well as a new show over on British soil and a greatest hits album bringing all their best bangers to one disc. Little did we know these were the bits and bobs. Friendship, truly, never ends!